Last week, the euphoria over US high yield bonds hit new post-crisis highs when amid a sharp slowdown in supply, a rise in the oil price and generally solid economic conditions, insatiable buyers of junk sent the Bloomberg Barclays Corporate high yield spread to the lowest since before the financial crisis, dropping as low as 303bps, the tightest level since late 2007 before drifting somewhat wider during the late week bond rout. 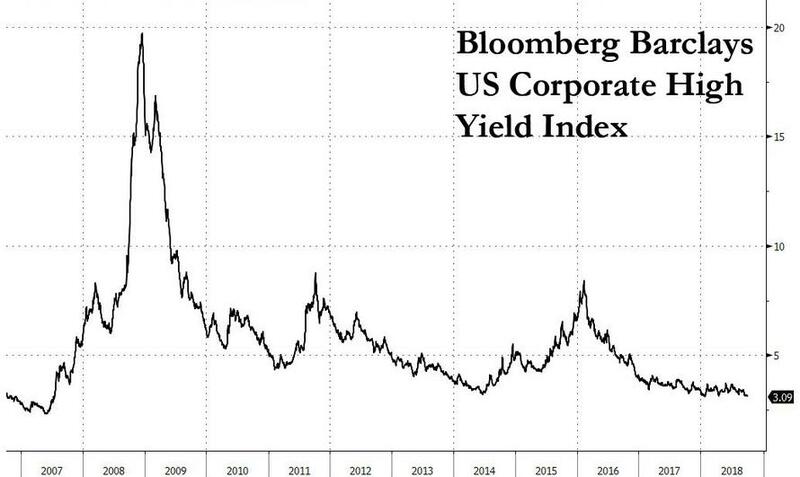 As US junk bonds have remained surprisingly resilient in the face of last week's rate rout, even as investment grade spreads have continued to drift wider resulting in a , questions have started to emerge about just how much longer this high yield complacency can sustain. Addressing this issues, Michael Eisenband, co-head of corporate finance and restructuring at FTI Consulting, wrote that "we may be enjoying the longest bull market ever, but those skyrocketing security prices can’t hide the fact that it’s also "the junkiest bull market on record." One particular risk highlighted by the distressed debt expert is the ongoing deterioration in credit quality, as a result of which “we are in uncharted junk terrain today compared to precedent periods of the last three decades, with corporate credit quality, as measured by ratings distribution, far weaker than at previous credit cycle peaks of 2000 and 2007. It isn’t even close." Of note for junk bond bulls, Eisenband writes that "U.S. Corporate credit metrics, however you measure them, are worse today than they were in mid-2007 when the last credit cycle was peaking. Many speculative-grade companies, led largely by private equity sponsors and pliant lenders, are choosing financial exuberance and ignoring the lessons of the 2008 crash." 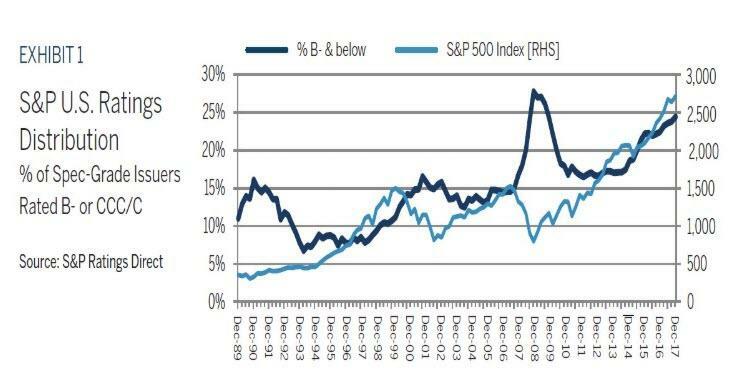 Specifically, around 56% of all S&P-rated U.S. corporate issuers today are speculative- grade, compared with 49% in 2009. Putting the outstanding debt in context, there are currently 456 U.S. corporate issuers rated B- or worse, double the number in mid-2007. 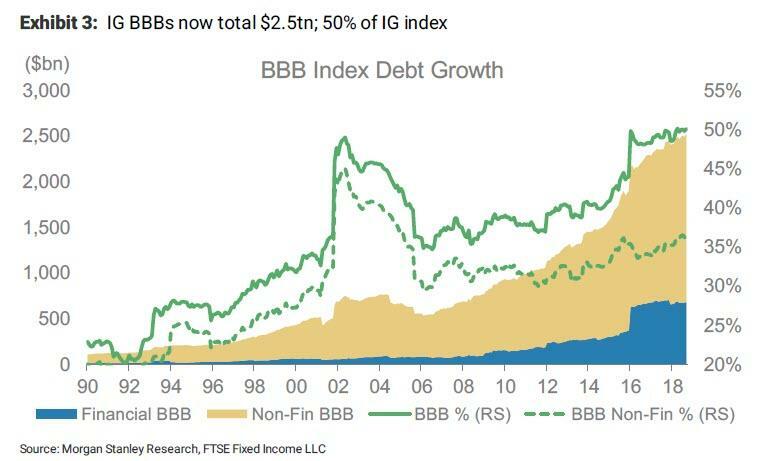 As a reminder, over the weekend we reported that the next big risk for the corporate bond market is the $2.5 trillion in BBB-rated investment grade debt, which Morgan Stanley warned could see as much as $1.1 trillion in downgrades to junk, unleashing a shockwave across the bond market. As a reference, there is roughly $1 trillion in junk bonds, which means the next recession, and wave of downgrades, could double the size of the high yield market. This, of course, ignores the credit quality deterioration within the junk sector, which, as Eisenband concludes, is influenced by two opposing forces. First, quality improves as corporate operating performance gets stronger. But that improvement is offset by aggressive borrowing to finance expansion and shareholder returns. Unfortunately, over the past decade the "aggressive borrowing" has had a far greater impact on the overall market, which explains why once the next recession hits not only will defaults spread like wildfire but recoveries for bond investors will be the lowest in history. Last month marked the longest bull market on record at 3,450 days, with the S&P 500 Index making an all-time high in late August, surpassing the previous record run from late 1990 through early 2000. It has been a remarkable run since the end of the financial crisis, fueled by record-level corporate earnings, artificially low interest rates and some $3 trillion of liquidity provided to financial markets courtesy of the Federal Reserve. Even better, this bull run, which has seen the S&P 500 more than triple off its lows of the 2008 crisis, has been characterized by low volatility and surprisingly few white knuckle moments for investors. It is also the junkiest bull market on record. ... and an average speculative-grade credit rating based on a numeric shorthand (BB+=1, BB=2…CC/C=7) (Exhibit 2). Both these measures of credit quality in Exhibits 1-2 are juxtaposed against the S&P 500 Index. Corporate credit ratings during periods of economic expansion are influenced by two distinct and countervailing forces. Credit quality in times of cyclical growth should improve as corporate operating performance strengthens and operating metrics trend more favorably. This is often offset, to varying degree, by more aggressive financial policies during prosperous times, as issuers are disposed to borrow more heavily against improved earnings and cash flows to finance expansion and shareholder returns. The latter typically tends to outweigh the former in the late phases of an expansion, and credit quality tends to weaken, on balance, over the course of an economic upswing. This has been the case during previous expansions of the late 1990s and 2003-2007. But we are in uncharted junk terrain today compared to precedent periods of the last three decades, with corporate credit quality, as measured by ratings distribution, far weaker than at previous credit cycle peaks of 2000 and 2007. It isn’t even close. Much of this deterioration has occurred since early 2015.